The house was fabulous, but the icing on the cake is the management company. They are small and family owed. Mary, the owner, was amazing! She personally met us after hours to let us in and tell us about the place. She had a lovely welcome gift on the kitchen counter top. She also offers discounts at her other businesses for her renters. They have a rentals shop and an adorable boutique. We rented 2 golf carts one day and one the next! They were so much fun! Manager gave great recommendations for local restaurants, fish market, sight-seeing, and shopping. Will always request Sunshines Cottage for our return visits to Port A. Would recommend Raggdoll Boutique, Island Surf Rentals, Port A Brewery, Port A Seafood Co, the candy store, and Virginia Bay at sunset, to name a few. My family had the best beach vacation ever! This home is beautiful and perfect for a family vacation. We plan to make this a yearly vacation tradition. Our stay in this home provided first class accommodations with the perfect location to all restaurants and shops. The owners are wonderful to work with and make you feel welcome. 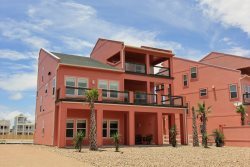 I cant say enough how much we loved this beach home! This was such a wonderful place to stay for our yearly family vacation. We come out every year to celebrate my sisters birthday and figured it would be nice to all stay under one roof. There were 9 of us total and the place was so roomy. The beds were very comfortable and we had everything we needed. We enjoyed the pool and also being able to cook our own meals. We Def plan to be back. Only thing missing was a cutting board nothing that cant be bought. We would like to also thank Mary and her family for being so helpful and very prompt and answering any questions we had. We travel to Port A alot, have owned vacation homes, and Im also a Decorator; therefore were picky :). We loved this cottage because it was decorated too cute in a fun modern way, full of every convenience , and very clean. Mary made sure that all our needs were met and she was very gracious to even buy an iron since the unit was brand new and they didnt have one in there yet. We had plenty of room for a large family and also a large dinner with guests on one night. We would highly recommend this cottage and return! Very nice place, close to everything! We really enjoyed are stay and will be booking again in the near future!